I've been learning more about the Rebel XT, and trying my hand at some sports photography. 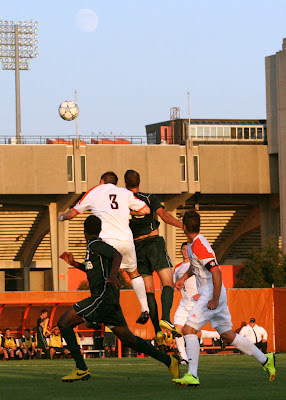 The BGSU men's soccer team has been an excellent subject for my experiments with camera settings in changing light. Night games start at 7pm when the sun is low and golden orange, creating long shadows of the bleachers across the field. It seems that each passing minute the light changes again and I have to check my results along the way. By 8pm the sun is below the trees and the stadium lights are on, providing just enough light for photos but with a much slower shutter (relatively slow, still up around 1/2000th of a second). I'm resisting the urge to turn this blog into an "Eric experiments with cameras" blog, and trying to remain loyal to my initial topic. 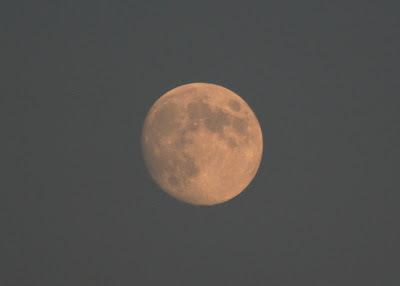 With that in mind, here are some shots of the moon rising over Doyt Perry Stadium as seen from Cochrane Soccer Stadium on Wednesday, August 29. The second full moon in any calendar month is known as a Blue Moon. 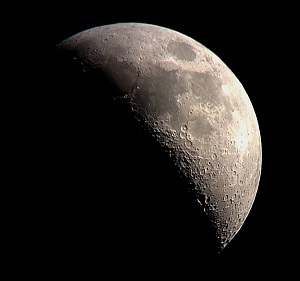 The moon on Wednesday was only 97% full, and won't reach its peak until Friday, August 31. Actually, I just read that the whole naming tradition was founded on a mistake in the first place... oh well.